During the early season, the support staff of most teams are content just sitting on the sidelines or in the pits, waiting for a flat tire or some other mechanical to pop up. But once the weather turns, those staffers must step up. On muddy days they become a true part of the team, and can have a tangible effect on the outcome of the race. The degree to which these mechanics and staffers have trained to clean bikes quickly, and the effort they’ve made to be prepared for any eventuality, is an integral part of their racer’s day. 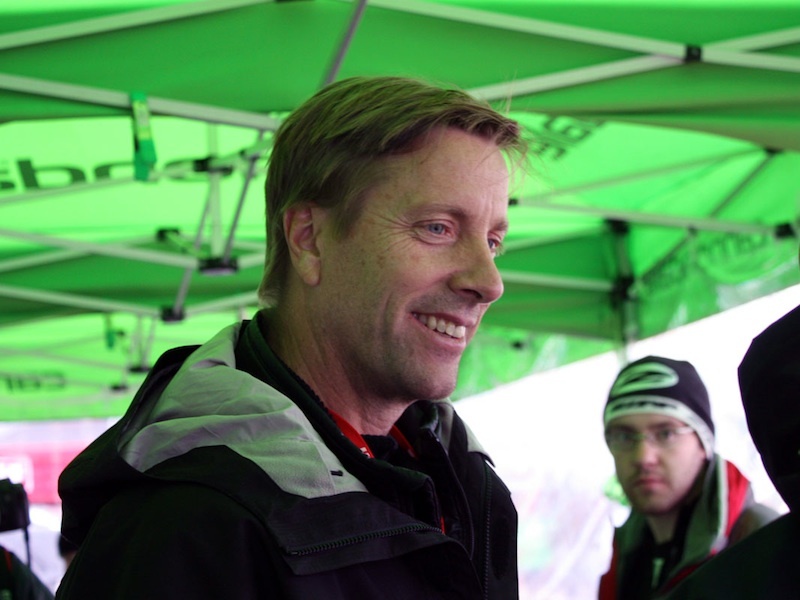 BikeRadar caught up with Cannondale-Cyclocrossworld.com’s Stu Thorne, America’s most seasoned ‘cross mechanic and team director, to talk about that shift from the warm happy days at the start of the season to the harsh reality of winter racing. Shifting from dirt crits earlier in the season to true cyclo-cross elements. How does this transition go for the Cannondale-Cyclocrossworld.com team as the year progresses? It’s the same for me every year. The first half of the season is relatively mild and then, it doesn’t matter if it’s in October or November, but whatever that first muddy race is, it’s always an eye opener – and this was last weekend. What’s the first thing that smacks you upside the head during the shift every year? It increases the workload tenfold, which is okay. I don’t mind it – it’s fun, it’s different. To be honest, it gets kind of boring to do dust bowl races and grass crits – that’s not real ’cross – and having the mud in there usually mixes up the playing field a little bit. So, it was nice to have a muddy race, because it just changes the game for everybody. But for us [the staff], and from a technical or workload perspective, it’s just amazing how much more work it involves. What’s the team dynamic like before and during a race like this? The pre-riding for the team is much more important. They’ll go out to a dust bowl race and they can go do two laps. But when you have a race like Saturday in Fort Collins, you have more factors. The guys are going to get there early and do some preview laps. Not only are they going to learn the course, but they’re going to learn different lines. The interesting thing with a race like Saturday was that the lines and the course changed hourly. That held true as we moved into Sunday and it dried out more and more. They come and ride the course at noontime and their race is at three, so they’re going to want to go back out before the race and see what’s changed. It’s all about tire pressure. When the weather changes and it becomes muddier, tire pressure becomes more critical, so we spend a lot more time on it. On a dry day, we just set it at 29psi or 28psi and off we go. But when you’re running 22, 23, 24, 25 depending on the rider, it definitely makes a big difference when you can mix it up a little bit to find the perfect traction. It makes the support staff more important to the outcome of the race too, right? During the race you’re switching bikes, and I think we were doing it about every lap-and-a-half to two laps. It wasn’t one of those races where you’re doing it every half lap, which we’ve had in past years. That’s total chaos, but completely doable. We try to have a good team together. We had a good team on Saturday, and we made a couple of little errors but nothing major at all. We don’t want to have mistakes in the pits. Usually mistakes come from trying to wash a bike and just not having it ready in time. I’ve seen that happen to lots of people, lots of times. So yeah, we’re involved more during the race, and the dynamic is different. We’re involved more before, during and after the race. On Saturday night we have to take all the dirty bikes that have been trashed and pressure washed five or six times, and make sure that they’re ready for Sunday’s race. What does it take to get a totally trashed bike ready to do it all again the following day? We have a pretty good system after the race where every bike gets washed completely and everything gets lubed so that we can put them on the truck overnight and let them dry without getting all rusty and mucked up. Then the next morning prior to the races we’ll go through everything from top to bottom, and re-lube and replace if need be. We replaced a handful of cables and a chain, but Saturday really wasn’t too bad. Post-race we do a little bit of extra work to make sure the pre-race for the following day goes a bit more smoothly. How do you handle three guys in the same race. Does each racer get his own staffer, or does each staffer do a single job? Ideally we’d have two guys per rider, but we just don’t have that. It gets a little bit tough because our riders are relatively close in ability. There was one point on Saturday where all three came in within two or three seconds of each other, and that’s when the mistakes happen. Once the first two laps go by it gets a little easier. The riders spread out a little more and there’s not as much of a cluster in the pit. I usually end up doing most of the hand-ups. So somebody will catch a bike, I’ll hand-up, then somebody feeds me another bike and they’ll catch and I’ll hand-up that bike. Do you guys train as a team, or practise the hand-ups? Nope. We should, and we always talk about it, but I’ve been doing it long enough – and with Tim Johnson and Jeremy Powers especially; I’ve been handing bikes to those guys for a long time. One thing I’ll ask those guys to do on their sighting laps is to take one lap through the pit to give me feedback on where it’s bumpy and where might be the best place to pit. We’ll assess the situation in the pit too, and try to put distance between certain teams. If we were right next to Ryan Trebon, it doesn’t make any sense, because he’s probably going to be in the mix with us. We try to spread out a little bit, but sometimes that’s not possible. We also assess the water situation and how we’re going to get to the water. I really like having that, and sometimes I feel that it’s a bit unfair. But at the same time, if the promoters supplied enough water for us we wouldn’t do that – nor would we have to. There have been a number of races in this country where the promoter has woefully fallen short on supplying water and pressure washers, or the location isn’t conducive – it’s just crazy. So, in past years we’ve done everything from supplying our own barrels of water to getting that pressure washer. For us to wait in those lines for a hose – yes sometimes it’s a hose, not even a pressure washer – is ludicrous. We’re talking about category 1, high profile races; we should have water. I understand that it’s expensive to provide that sort of stuff, but I guess that’s part of promoting a race. For a World Cup event, the promoter has to provide at least six, if not a dozen, pressure washers. But for category 1s and 2s there’s actually nothing that the promoter has to do. I can’t fault the promoter totally, I just think it’s smart. It makes it fair to all the teams who are there if there are adequate pressure washers. I’ve been to a lot of races – including the Nationals one year in Portland – where the line was just forever long, and there was no way you were able to do changes every half lap, and that, to me, is crazy. So we’ve learned over the years to supply our own stuff. Whenever we can we’re trying to be self-sufficient. How much back and forth is there between you and the riders during the race. Are you coaching while the race is on? Usually with those guys we just give them encouragement. Tim and I have been working together for a long time, and he likes different bits of information. I give him the same amount of encouragement, but in addition to that he wants splits all the time. He bases a lot of what he does on lap times; knowing where the guy in front of him is and how many seconds back he is, or if he’s got 10 seconds on the guy behind him; he wants to know that sort of stuff. I don’t give him lap times, because I don’t have the ability to do that as well as everything else I do. So I just give him information every half lap, that say, he’s 10 seconds down on so-and-so and seven seconds up on the guy behind him, or if he’s in the lead it’s just plus-10, and so he’ll know that he’s 10 seconds up. He can do a lot of it in his head. He’ll look back and figure it all out, so he’ll know if he’s gaining or losing. The courses overlap and you can always look behind you. Wow, splits in your head while racing, that’s pretty advanced. What’s the most important equipment for the rider on a weekend like we’ve just had? I’d say tires, by far. And, I’d imagine, knowing how to use them? It’s funny. That’s a good point to bring up because the guys have all been using the tires for a long enough period of time – very supple tires at very low pressures in some cases – and they’ve learned how to ride them when they’re set up like that. Take Kaitie Antonneau, who’s a new rider. She’s only 18 and she’s never had Dugasts before. She could ride at 18psi on a course like Saturday’s, but because she’s new she hasn’t spent enough time learning how they handle like that when they squish and squirm around. It’s a sensation that takes some getting used to, so she ends up riding a little higher pressure. Over the course of time, we’ll say: ‘Go try this and tell us what you think’. She needs to learn how to do that, and I think that’ll ultimately help her get the most out of her tyres. How about a pitting tip for the rest of us? When your bike gets all clogged up with mud, just change it. Don’t even think twice about it. You might lose five seconds going into the pit but you’ll gain the five seconds back because your bike is five or 10 pounds lighter. It’s something that as you do it more and more it becomes easier and easier, and you’ll realise that it’s a huge advantage. What’s the most important piece of equipment for you and the mechanics in the pit? I don’t mean to sound so broad about it, but the whole setup. Heat in the trailer is huge, so you can work on bikes that are actually warm. The bikes get cleaner, things dry faster and you can work on things easier. That whole truck and trailer thing is so indispensable. It also allows us to put a 100-gallon tank on and carry the hoses and the pressure washer with us. It’s not a problem – we have room to do that and it’s a huge asset. It’s not really a tool, but it’s an advantage. What would make the setup even better? I appreciate why the Belgians all show up in motor homes – it’s a great way to go. I wish we had a motor home here, sometimes, but… we make do with what we’ve got. [Some laughing ensues from both interviewer and interviewee – Ed.] I know that sounds like a snotty thing to say, but having a motor home is pretty key, especially when it’s 35 degrees and raining sideways.